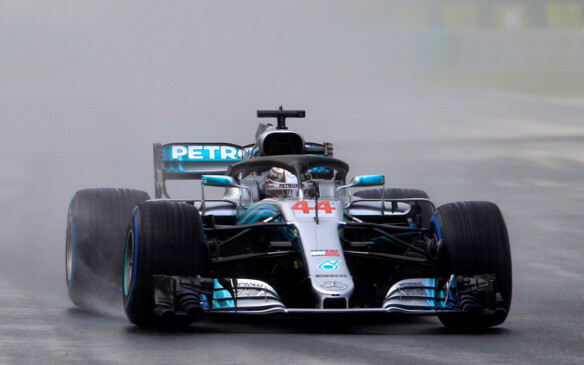 Budapest: Lewis Hamilton again showed he is untouchable in the rain, producing a brilliant last lap to take pole position for the Hungarian Grand Prix ahead of Mercedes teammate Valtteri Bottas on Saturday. Mercedes head of motorsport Toto Wolff could hardly believe it as he watched from the team motorhome, clutching his head in disbelief as Hamilton beat Bottas’s time to secure a record-extending 77th pole position in difficult track conditions. Just moments earlier, Mercedes’s Formula One rivals Ferrari were 1-2 with Kimi Raikkonen ahead of Sebastian Vettel. Earlier on Saturday, the third and final practice was held in warm and sunny conditions, but by the time qualifying started there was rain, thunder and even some lightning. “We are free to fight, so I’m looking forward to it,” said Bottas, looking ahead to Sunday’s race. Although the Finnish driver regularly insists he is on an equal footing with Hamilton, the widely perceived view is that he is effectively No. 2. The narrow Hungaroring track, nestled in rolling holes on the outskirts of Budapest, is among the most difficult for overtaking circuits in F1. It is considered more favourable to cars with a strong downforce like Red Bull and Ferrari. It certainly looked that way when the weather was warm and things were going Ferrari’s way, which explains Wolff’s unchecked delight at the end of qualifying. Vettel was fastest in third and final practice in dry conditions earlier Saturday and also in Friday’s second practice. Hamilton did not finish higher than fourth in all three practice runs. Red Bull driver Daniel Ricciardo was fastest in first practice, but only 12th in qualifying after his team misjudged which tires to use when it started raining. Teammate Max Verstappen could only manage seventh behind French driver Pierre Gasly’s Toro Rosso car and the Renault of fifth-place Carlos Sainz. The British driver complained on team radio about a lack of grip, having also been concerned with his tires. Early into qualifying, Hamilton even feared his tires were “falling apart” but once again he proved himself to be the best in wet conditions. Force India drivers Esteban Ocon and Sergio Perez were among the five drivers who failed to reach Q2, which won’t lift the team’s mood after it went into administration late Friday.